We are asking that Allah dress us from His Mercy oceans and love oceans. Alhamdulillah if we don’t know where we came from we don’t know where we are going. Always a reminder that whatever teachings, if something is not understood to have patience so that it can dress the soul and enlighten the soul until the soul has an understanding. As we understand that we come from our mother and we enter into this world by a means and a source. That is an important because they want the mind to think and understand from the heart that you come from your mother. And if you tell somebody that they will never say, “It is shirk,” or “No you come from Allah.” Of course everything comes from Allah (Azza wa Jal) but by means of your mother you are coming onto this Earth. 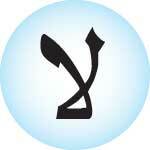 Means there is a wasila, a means, through which you arrive onto this Earth. The Haqayiq and reality of the soul is based on laa ilaha illAllah Muhammadun Rasulullah (sallallahu wa sallam). So when we understood that we came into this world by means of our mother and father. And that is not an association and partnership with Allah (Azza wa Jal), this is not about worshipness, but “Who knows himself will know his Lord”, his lordship and that which governs him. The way of marif’ah and Gnosticism, is in the quest of: where is it that I come from and that will begin to describe where is it that I am returning to. We come from a source, we come from a reality and to that reality we shall return, wa ilayhi rajioon. Allah describes in Surat Yaseen that “My Subhaan upon the Malakoot and it is all encompassing and to it you are going to be returned.” Means we come from the Malakoot, we come from the world of light and to that world of light we shall return. If in the way of marif’ah you say okay that your light is from the light of Allah (Azza wa Jal) then now you move into becoming a partner with Allah (Azza wa Jal), laa shareek, there is no partnership with Allah (Azza wa Jal). There is no resemblance to Allah (Azza wa Jal)! Allah (Azza wa Jal) is a Qudrah and Power that we know as laa ilaha illAllah which describes the Oneness and everything in the Malakoot is powered by that Oneness! It is not the Oneness of laa ilaha illAllah that we return to, but the oneness of the ocean of Muhammadun Rasulullah (sallallahu alayhi wa sallam). That is important in our marif’ah not because we are constantly describing the Haqayiq and the realities of Sayyidina Muhammad (sallallahu alayhi wa sallam), but the importance of the Muhammadan reality is our reality. 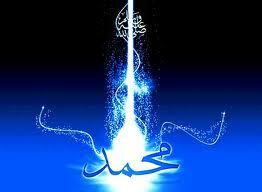 Allah (Azza wa Jal) describes “Feekum Rasul“, that light is “in” you, that reality is “within you”. Means the first thing that Allah (Azza wa Jal) created is my light. For us to understand that all the Prophets in (the verse) amanar rasul, (Surat al-Baqara, 2:285) Allah (Azza wa Jal) is describing all the souls of the Prophets. We envision a huge ocean of light, all the souls of the Prophets are the heart of that reality, that Nabi, means they have Noor of Bahrul Qudrah. These are predestined realities that Allah gave to those souls. Means from that whole world of light what we would understand is the Qalb and the emanation of power. Everything has a source of power like you follow a water stream and you go to the waterfall, its source. The source of all that power, what we understand is the Qalb, all the souls within that Qalb are from the Prophets and the Messengers. Whomever one of them you love, takes you back into that ocean of the heart. It means the love and the bond of love is through the Malakoot, that love traverses all time and all space and all realities; it is the most powerful bond. It is not the bond of understanding through the head but it is the light that begins to emanate through the heart. They teach us with that light and that love your soul will bond with them. And all of them are in the heart that is why in the latayif of the Qalb they have to teach us. Sayyidina Adam (alayhis salaam) teaches us that if you are coming in our heart where we are all associating, we are in that diwan, what we call the ‘association of the Prophets’, their souls are in that ocean. If you want to come and be familiar with our souls, then let us teach you the latayif and the realities; the subtle reality of your soul and your heart. Sayyidina Adam (alayhis salaam) is first and the keeper of knowledge. Sayyidina Nuh (Noah) (alayhis salaam) is second [level of the heart] and the reality of the soul and building the ship of realities, Sayyidina Ibrahim and Sayyidina Musa (alayhis salaam) and Sayyidina `Isa (alayhis salaam) and then Sayyidina Muhammad (sallallahu alayhi wa sallam). It means the teaching for us if we don’t know where we are coming from, we don’t understand where we are going back to. 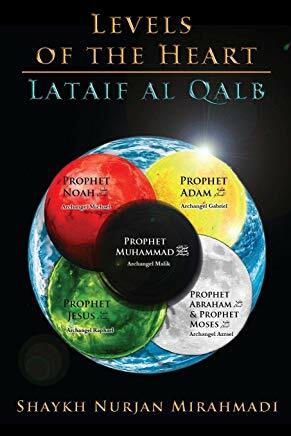 The way of the Haqayiq and realities, the way of marif’ah is coming and teaching us that hadith Prophet was describing that, “The first of every creation is my light.” It means that everything comes from the Muhammadan Light, the Prophetic Light. 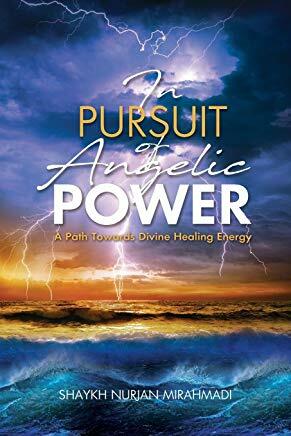 For other faiths that are watching, it is the Prophetic Light and all the Prophets are in that center, all from their realities Allah (Azza wa Jal) is creating everything. It means, when you begin to ponder that Malayikah are from the light of Prophet (sallallahu alayhi wa sallam), the Holy Ka’bah is from the light of Prophet (sallallahu alayhi wa sallam), Bayt al Mamur is from the light of Prophet (sallallahu alayhi wa sallam), Arsh ar Rahman from the light of Prophet (sallallahu alayhi wa sallam), all Paradises from the light of Prophet (salla allahu alayhi wa sallam). 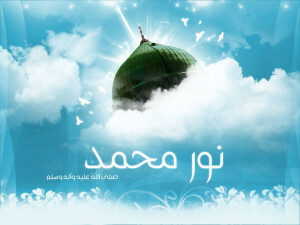 And then a no-mind person wants to discuss: should we do Mawlid or no Mawlid [celebrate birth of Prophet Muhammad (s)]? It is absolutely… you have lost your mind. Paradise is Under Mothers’ Feet, What’s Under Prophet (s)’s Feet? Then we understand the significance of praising upon the Prophet (sallallahu alayhi wa sallam) because we are beginning to understand our reality: where is it that I come from yaa Rabbi? (Allah says) why did I ask you to respect your mother? Can you be adam, a human being if you don’t respect your mother, the source that brought you onto this Earth? You are Abtar, you become like a person cut-off. Allah (Azza wa Jal) describes that, no, no, Paradise is under your mother’s foot. This was a vehicle to bring my physicality onto this earth. What you think about the source of my soul? If my soul is coming from the Muhammadan Light and Allah (Azza wa Jal) is describing that Paradise is under my mother’s foot, then what is under the foot of Sayyidina Muhammad (sallallahu alayhi wa sallam)? 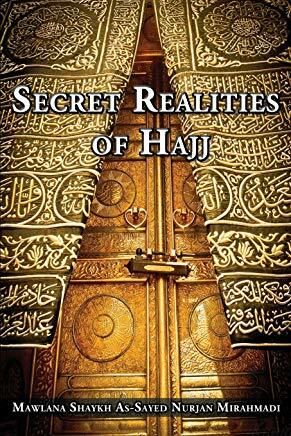 Every Haqayiq, every reality, everything that you can imagine through the heart (is under his foot). But worshipness is for Allah (azza wa Jal) (only); prayers are for Allah (Azza wa Jal). Because we are trying to understand the ocean of Creation and not the Creator. We don’t come from the Creator, we come from the ocean of this Creation and to understand my source and where is it that I come from yaa Rabbi. As an orphan child, a yateem, you watch on Television and it is very sad for the children who have been given away at birth. With all that they may have accomplished in life, there is still an emptiness to find who their parents are? Who gave me away for a reason or for no reason? There is a hole in their existence. Imagine the salik, the seeker? Yaa Rabbi where is it that I come from? Who gave me this light? What is it that I owe this light? How am I going to return back to that light? They begin to teach and if you think a little bit, Prophet (sallallahu alayhi wa sallam) is describing that: the Ka’bah and the angels are from my light, everything is from my light, so you are from my light. Because one drop and one drop is one drop. 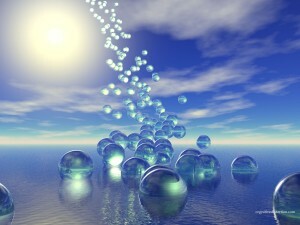 This is not the world of form anymore, one drop of water and one drop of water makes an ocean. In the ocean everything is lost and annihilated in the oneness of that reality: wa khalaqal insaan min nafsan wahid and we created its zawj, its reality. Not that we find its soul mate and we say, “That is my wife, she’s my soul mate.” That is your wife. The mate of your soul, the reality of your soul is where is it that you came from? What ocean did you come from and it can’t be the ocean of the Creator. The Creator is the Creator and Allah (Azza wa Jal) is laa ilaha illAlah. When we say laa ilaha illAllah which is the first zikr that means there is absolutely forget about Me. Don’t look at Me and that you come from Me, or you are like Me, that you breathe with Me, that you eat with Me, I am beyond that. I created Hay (Life) and Mayt (dead) to test you. Allah (Azza wa Jal) is not even in the Attributes; the Attributes are a description of the reality in the divine kingdom of Muhammadun Rasulullah (sallallahu alayhi wa sallam). Because you cannot give the Attribute to Allah (Azza wa Jal) al Hay, we are singing it in the zikr, Allahu Hay, Allahu Hay, Allahu Hay, but Allah (Azza wa Jal) is not Hay because Allah (Azza wa Jal) is not Mayt (dead). There is no life, nor dead for Allah (‘Azza wa jal). Allah (Azza wa Jal) [[says] I created life to test this Creation, I created death to test this Creation. 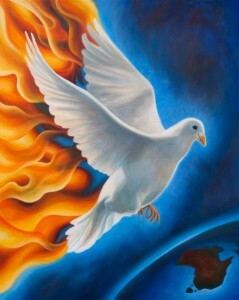 It means every Attribute is a divinely description or a direction and a sign that points to the oceans of Creation. You want to know My Mercy it is in that ocean of Creation. By Mercy I have dressed your souls, by blessings I have dressed your souls, and by Generosity I have given you life. Siffat al Khaliq (The Creator), I keep for Myself and I am uniquely the Creator of all Creation. Means that is the importance of understanding why Prophet (sallallahu alayhi wa sallam) said, “If you know yourself, you will know the lordship that governs you.” “arafa nafsahu, ‘arafa Rabbahu”. I gave you a tremendous honour, through your Qalb, your heart”. 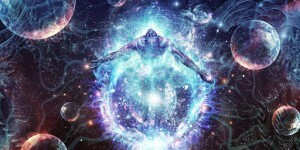 The heart of Bani Adam, and all his progeny can make a mira’j, make ascension. As soon as they go into their heart and begin to find their origin that: I come from a world of light. And the world of light is not like this world of form where we discriminate and we based it on status. A world of light that has no form means that one drop and one drop is still one drop. One billion drops is still one drop. Then the mira’j into that drop, yaa Rabbi let me be taken to where all those drops are going, into that ocean, into that reality and let me be lost in love of that reality. As much as you begin to praise upon the Prophets, praise upon Sayyidina Muhammad (sallallahu alayhi wa sallam) that reality will begin to pull you up. They begin to pull you up and pull you up and begin to crush all of the desires of the physicality. All which is physical is so temporary and everything we are seeking is from that reality. Yaa Rabbi let me to return back to the ocean of Muhammadun Rasulullah. That is where Nabi Musa wanted, that the Pen was writing laa ilaha illAllah for seventy- thousand years and then began to write Muhammadun Rasulullah (sallallahu alayhi wa sallam. Then it began to write Bismillahir Rahmaanir Raheem. 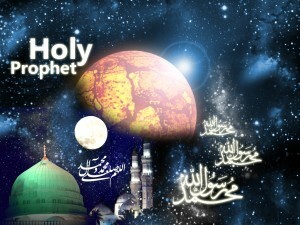 Means before the unfolding of all Creation which is known from Bismillahir Rahmaanir Raheem is the story of Creation. Before that was the story of Laa ilaha illAllah Muhammadun Rasulullah (sallallahu alayhi wa sallam). That Nabi Musa said, “I want to reach where the two rivers meet. I want yaa Rabbi not from the reality that you gave to me, for me and for my community, I want from Your Heavenly Reality where the two rivers meet. I want from laa ilaha illAllah Haa, Meem م (Shaykh joins two hands from Haa to Meem م) Muhammadun Rasulullah, I want from that ocean where Hidayat meets with the Waw and these are the people of Hu. The Hu describes whom? 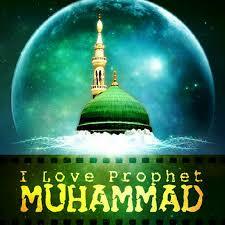 It is the Hu of Muhammadun Rasulullah (sallallahu alayhi wa sallam). 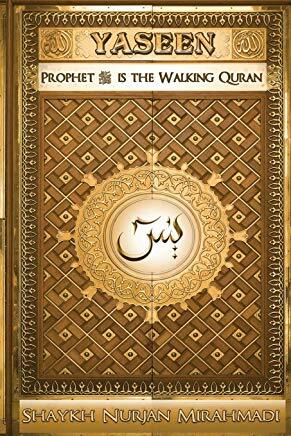 Nabi Musa wanted that reality and it was known (to him) when he was walking on that path. He found it as soon as the fish came to life. Fish came to life because these are the people of hayaat, they can bring that which is dead back to life, not resurrect the physical dead. The physical dead they do not need as they are already back with Allah (Azza wa Jal). 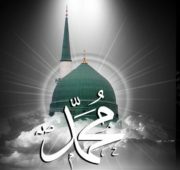 But the light and the emanations that are emanating from their (the people of hayaat) souls because the light that is emanating is from the light of Prophet (sallallahu alayhi wa sallam). That light can revive the soul that has given up hope, the soul that is bewildered and lost, that light and that emanation begins to dress it. 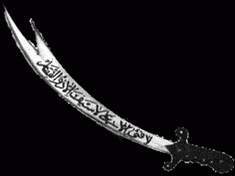 That is the sword that Allah (Azza wa Jal) gave to Sayyidina Muhammad (sallallahu alayhi wa sallam) the Zulfiqar. Zulfiqar is the laa ilaha illAllah Muhammadun Rasulullah. It is the Laam Alif, that the handle is the point of Laam Alif where they meet; the Laam and Alif meet and the two blades that come out. That reality guarding laa ilaha illAllah Muhammadan Rasulullah. These are from `Ibaad ur Rahmaan, its guard is Imam `Ali (‘alayhis salaam). The reality is the first zikr is laa ilaha illAllah; Laa comes to the head that, ‘don’t use the head’, ilaha ‘nothing but’ (pointing towards right shoulder) illAllah (moving from right shoulder to the left and the heart) ‘nothing but Allah into the heart’. It means that is the reality of Lam Alif , that is the reality of the Muhammadan Reality. We make that salawat by praising upon Allah (Azza wa Jal) allahumma salli `ala Sayyidina Muhammad wa `ala aali Sayyidina Muhammad (sallallahu alayhi wa salam). Means every flower is growing from the Muhammadan Light, every drop of rain from the Muhammadan Light, every tree from the Muhammadan Light, every soul is coming from the Muhammadan Light. Everything in Creation is coming from the light and all of it praising upon Allah (Azza wa Jal) through Prophet (sallallahu alayhi wa sallam) by saying, allahumma salli `ala Sayyidina Muhammad wa `ala aali Sayyidina Muhammad (sallallahu alayhi wa sallam). So Mawlid an-Nabi (sallallahu alayhi wa sallam) is not only the celebration of Prophet (sallallahu alayhi wa sallam), it is the celebration of our existence. That in every moment, everything in this Creation is praising upon Prophet (sallallahu alayhi wa sallam); praising the Divinely Presence that: yaa Rabbi you gave us an existence through the ocean of Muhammadun Rasulullah (sallallahu alayhi wa sallam). If not for this ocean of Muhammadun Rasulullah (sallallahu alayhi wa sallam) we are non-existent. So everything is praising and thanking Allah (Azza wa Jal) for that existence and for that life. We pray that Allah (Azza wa Jal) join us in that praise and in that love and for us to understand where we come from. When you begin to understand where you came from, you begin to correct your adab (manners). 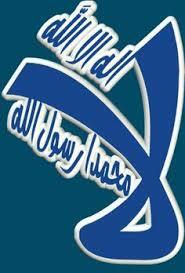 When you make istighfar y(ask forgiveness), you say: yaa Rabbi, yaa Allah astagfirullah, astagfirullah, astagfirullah. The Ahlul Marifi’ah got a reply back, “Yaa ‘Abdee y(o my servant) you have nothing to do with Me. Don’t think you harmed Me, I am far beyond anything that you can approach.” Who did you harm? You harmed Sayyidina Muhammad (sallallahu alayhi wa sallam). And from ayat al Quran, qulna yaa naaru koonee bardan wa salaaman – Allah (Azza wa Jal’s) Qul, His Divinely Speech is a fire that nothing can cool it but the reality of Prophet (sallallahu alayhi wa sallam). 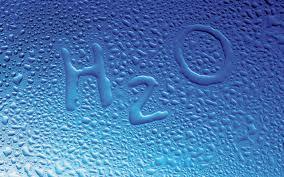 Means everything comes from that water and from that sweat. That Allah (Azza wa Jal’s) praise upon the reality of Prophet (sallallahu alayhi wa sallam) and Prophet (sallallahu alayhi wa sallam’s) coolness and tranquility to take that and all the sweats of dew that come into existence, those are all the pearls of Creation, and every Creation is within that lamp. We pray that Allah (Azza wa Jal) dress us from those lights, bless us from those lights and allow us to return to that reality. Subaana rabbika rabbil izzati `amma yasifoon wa salaamun `alal mursaleen wal hamdulillahi rabbil `aalameen. Bi sirri surat al-Fatiha.